A little cardigan to add a touch of style. Plain lace with stockinette faced edges. 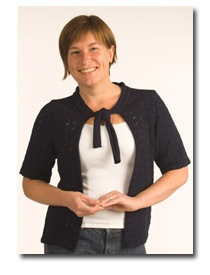 Short, set-in sleeve; open front, with slight vee shaping to neckline, held closed or not with the tie.